Why Sleep Should Be Prescribed? How To End Chronic Disease with Metabolomic Medicine? Novel branch of medicine successfully identifies and addresses root cause of autoimmune disease. Health should be our biological norm. Yet, in the last century, it’s become an anomaly. According to a 2012 study by the England Journal Of Medicine, 60 percent of deaths in 1900 were attributable to acute causes (infections, tuberculosis, influenza, etc. ), whereas in 2010, the overwhelming majority of deaths (88 percent) were due to chronic illnesses (cancer, heart disease, degenerative conditions). 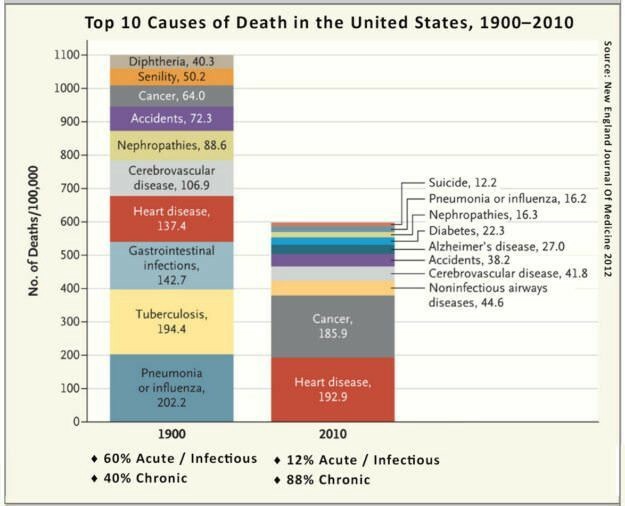 Cause of Death 1900 vs. 2010 in U.S. The Global Burden of Disease Study (GBD) points to a grimmer picture. Just one in 20 people worldwide were healthy, while one in three experienced more than five ailments in 2013. The surge in chronic illnesses over the last century reflects a historic paradigm shift. We live longer than ever, yet we’ve never been a sicker species. The rapidly escalating variety and number of chronic illnesses is a modern scourge. There are now over 150 autoimmune conditions (58 million cases in America alone) — counting just the ones that have been identified by modern medicine. Half the women and two-thirds of men will get cancer in their lifetime, with over 100 forms of cancer to pick and choose from. Then there is diabetes. Asthma. Arthritis. Cardiovascular diseases. Degenerative brain diseases like Alzheimer’s. And a wide spectrum of debilitating mental health conditions like depression. Our collective health is in a statistical freefall — with petite public awareness of the fact. Like Wile E. Coyote, we’re chasing a Roadrunner (life’s daily grind) over a precipice, then happily skedaddling above the abyss, until we notice someone waving a red-neon warning sign. In my case, the warning sign was a near-death experience with an antibiotic-boosted superbug. Doctors who kept prescribing more antibiotics nudged me to research natural alternatives. After I healed myself with colloidal silver — a millennia old natural antimicrobial that is deemed quackery by modern medicine — I began to question what else was out there that deserved more attention. I began to pick up new clues about the precipice. A puzzling number of friends, family, and colleagues were getting sick, becoming sicker, or dying from diseases labeled with incomprehensible modern acronyms. My father shriveled away in front of me from a chronic illness. But I didn’t know at the time. I was simply told by the experts that there was “no need” to continue life support. Chronic illness takes a long time to develop, which makes it more dangerous than most acute conditions. The body may perform significantly below its energetic potential, degrading faster than it should, before the disease becomes apparent. 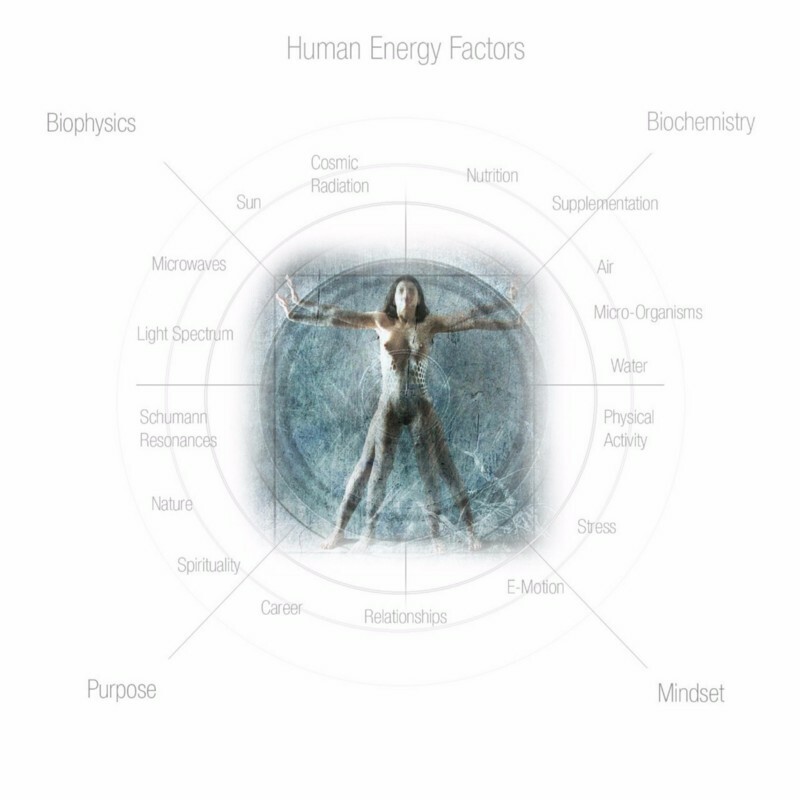 Living below our natural energy potential is how we jive today — we just don’t know any better. Even in the later stages of chronic disease, the majority of the people who live with debilitating symptoms, live in chronic denial about it. Their life quality devolves slowly enough to create the “boiling frog” syndrome. The water gets warmer in sufficiently small increments for them to ignore it — until it’s their cells that are boiling. The ones who decide to get help, face a plastic smile from their doctors. The diagnosis is overwhelmingly “incurable.” Modern medicine has barely caught up with the classification of new chronic diseases. Ergo, patients are treated for symptoms, with immune suppressants, antibiotics, and other pharmaceuticals that may provide temporary relief, but don’t stop the progress of the disease itself. If you try to gain objective data about your particular chronic condition, you’re faced with a deluge of material, most of which is slanted towards selling you a symptomatic relief. Practitioners of both modern and alternative medicine attempt to cash in on the demand with equal fervor. You’ll likely confront an informational Goliath, years of trial and error, experimentation and failures, with little odds of real healing — unless you’re lucky enough to discover the proverbial David with a slingshot. I came across one by sheer accident. How Do You Spell “Metabolomic”? You don’t come across the term “metabolomic” too easily unless you spell it into your search bar. You might guess it has something to do with metabolism. Very few doctors are even aware of the term. And like anything new, metabolomics is often met with skepticism, even by those in the know. But make no mistake. According to MIT Technology Review, metabolomics is one of the fastest growing breakthrough technologies. In 2000 there were zero studies published on metabolomics — by 2012 there were over 2,000. Today a vast amount of metabolomic data is being used to redefine nutritional science. But actual metabolomics practitioners are, well, hard to find. The center of the metabolomics revolution today is in Athens, the hometown of Hippocrates. It is spreading through Italy, Switzerland, Netherlands, Turkey, and the rest of Europe like a word-of-mouth forest fire, about to hit North America. The patients who experience the effects of metabolomics have become its emissaries. Reason being: metabolomics works. Metabolomics is the first truly Hippocratic branch of medicine that empowers the body to heal itself by identifying and balancing the precise biochemical roots of chronic disease in the human body. The key to metabolomics is that every individual’s metabolism is as unique as a fingerprint. That’s why the concept of a universal cure for any chronic condition is faulty, whether it comes from alternative herbs or modern drugs. There is no “fix-all” solution, method or approach, unless we first understand what exactly is the cause of the individual biochemical imbalance. In metabolomics, the novel factor is the precise measurement of how the human combustion engine converts and uses energy. A customized blood and urine test records over 5,000 “metabolites” — the molecular byproducts that represent the biochemical traces of the human furnace. Any blockades, toxin accumulation, mitochondrial wear and tear, or nutritional deficiency shows up as a marker in the scan results, after which it can be addressed with laser-targeted nutrition, supplements, and lifestyle change. The key to success is individualization of analysis and treatment. Linus Pauling was also the founder of “orthomolecular medicine,” a branch that attributed disease to a biochemical misbalance and its treatment to proper nutrition. “The nutritional microenvironment of our body cells is crucially important to health, and deficiencies in this environment constitute a major cause of disease,” Pauling said. By combining the “chemist of the future” with the principle of orthomolecular medicine, you wind up with metabolomics. I heard the term for the first time in 2015 while visiting a friend in Athens. George, 49, was convalescing from his own spectrum of ailments. He couldn’t stop raving, with Greek-accented English, about how “metabolix” had changed his life (the pronunciation made me think of Hergé’s Asterix and Obelix, the comic book characters who drank a miracle potion made by the village druid, Getafix, and then proceeded to beat up Roman armies with new vigor). I nodded a placatory “uh-oh” to a range of “miracle” supplements George lined up in front of me. My experience with Getafix type solutions had been disappointing in the past. George could sense my hesitation. The next day he dragged me to meet the leading metabolomic expert in the world, who happened to be his friend. The meeting changed my life. Dr. Dimitris Tsoukalas, 51, doesn’t look like a village druid. He has jet black hair and the presence of a healthy, keen, bright-eyed man in his mid-30s (his biological age was recently measured at 32). He explained the basics of metabolomics to me in the time it takes to clear your throat. It sounded too simple for me, but I had resolved to suspend my disbelief until further notice. I thought about questions and wiped the sweat off my forehead. I was secretly nervous. I hadn’t done proper medical checks in years. I felt fit, ate consciously, and exercised 3–4 times a week, but I was also 50 years old, way overdue statistically for Judgement Day. “So, shall we get you fixed up?” he said with a grin, reading my thoughts. After doing a blood and urine test, I had a follow-up meeting two weeks later. I was still sweating. If any of what I had read or heard was true, I was about to get a deep insight into both my present and future health. Metabolomic tests utilize a probability curve (based on over 15,000 case studies) to predict your health progression, should you continue your present lifestyle and diet. The data slapped me in the face. I wasn’t dying imminently, but I also wasn’t living optimally. Some of my neurotransmitter levels were off, in the region of 8000%. My Krebs cycle, the process in which mitochondria (the cell’s batteries) turn nutrients into cellular energy (ATP) was operating at about 60 percent efficiency levels. Several other markers were either slightly off, or about to go off. What struck me most was that I was living 40 percent below my energy capacity. If someone had given the same evaluation of my car’s engine, I would have sued the manufacturer. In California jargon, I was experiencing a bummer. But then another thought occurred to me. Now that I knew the truth about my biochemical misbalance, maybe this metabolomic wizardry also had the tools to fix it. Dr. Tsoukalas’ nutritionist customized my dietary and supplementation regimen for the next three months. It was the beginning of my most profound physiological shift in life. The most important realization for me was that we’re all unique in terms of our dietary requirements. There is no single “health diet.” My personal profile was that of a carnivore, a caveman to be more accurate. My body needed pure, organic meat for protein. I had gone way overboard with veggies. I was also consuming too much sugar. Although I thought I had quit sugar a decade ago, the tests pointed to excessive intake of red wine, orange juice and fruit, along with other simple and complex carbs. My individual plan boiled down to a ketogenic diet, high in fats (up to 65 percent), medium in proteins (25 percent) and marginal in carbs (10 percent). Bread, flour, pasta, rice (which I used to love), even quinoa, flew out the door. I learned to treat fruit as “nature’s candy,” something a Paleolithic man would come across maybe once a week. Sugar, henceforth, was damnation in powdered form. The same went for all processed food. Not only are they void of any nutritional value, they’re also packed with industrial chemicals and preservatives, i.e. toxins. A note on junk food: the staple American “Cafeteria Diet” contains on average about 12 percent fat, 23 percent protein and 65 percent carbs. This type of diet is associated with mitochondrial dysfunction, weight gain, and tissue inflammation, and also an increase of activity in the areas of the brain that process motivational control and reward behavior. It works like crack cocaine. You have to have more junk, to reward yourself, while you journey down the path of obesity and chronic illness. Learning about a truly functional diet involves breaking numerous Western dietary myths, of which the most destructive is the low-fat myth. The fact is that the more (good) fats you digest, the more fat you burn. The accumulation of fat in the body, which today has reached epidemic proportions (70 percent of Americans are obese, i.e. have more than 25 percent body fat), is mostly due to high carb intake. Excessive carbs convert into glucose and raise insulin levels, which signal the body to store the carbs as fat. The higher your Body Mass Index, the higher the likelihood of fat induced disease, especially coronary and diabetes. The list of incongruities between Western diet and what your body actually needs deserves a magnum opus. But it’s good to start from the basics, like the fact that high-quality saturated fats provide a steady supply of energy, reduces inflammation, and helps lose weight, thereby reducing the probability of chronic illness. As a result, my diet shifted towards virgin coconut oil, high-grade olive oils, saturated fats in meats, eggs, and organic butter and dairy, with special emphasis on monounsaturated fatty acids found in avocado, olives, beef and nuts, along with omega-3 fatty acids in fish. Ketogenic diet may not be for everyone (depending on the individual profile) but the principle of avoiding carbs is relevant for the majority of our species. Strict vegetarianism is another extremist fad to be avoided, which may be disappointing for a massive health food community, but is also apparent in the number of complications in strict vegetarians. The deeper you dig, the more you discover a golden middle road between plant and meat diet that is both ethical and wholesome. We live in a new, nutrition-scarce reality which requires new methods of survival. Heavy supplementation is one of them. An individualized, nutrition-rich diet is another. Fast forward three months into my new regimen. My typically choleric, ADHD type mindset had calmed down. For the first time I experience what it really means to be able to focus on a single task or be at peace amidst work chaos. 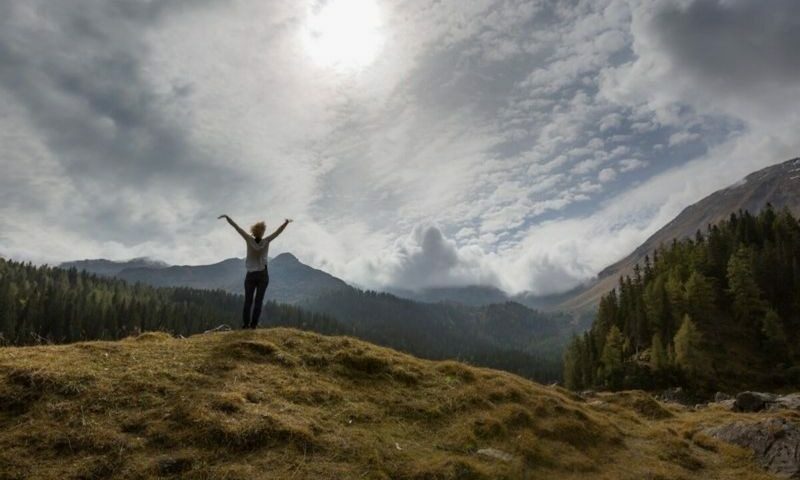 I was running sprints up the mountains and disappearing on six-hour hikes into the wild, coming back energized rather than beat. My senses had reached a new level of intensity. My thinking is clearer and more directed. And even though I was pigging out on fats (I’d grab the fat remains of your chicken or beef dinner, if I could), I was getting trimmed up, ripped up and 6-packed beyond my 20s peak. I got hooked. I began to research metabolomics in more depth. According to Dimitris’ book, How To Live 150 Years In Health, metabolomics is able to reverse a wide spectrum of chronic illnesses. A daring statement, which begs a question. If metabolomics was able to genuinely reverse chronic illnesses that were considered incurable, how did one Greek doctor possess the antidote, while the bulk of the medical community has been blithely unaware? Success is not just about “smarts, ambition, hustle and hard work,” concluded author Malcolm Gladwell in his study about disruptive thinkers and successful people in Outliers. The common denominator for people like Robert Oppenheimer, John Lennon, Bill Gates, and Albert Einstein was also luck. They happened to be at the right place at the right time, combined with the drive to pursue their field with singular focus for at least 10,000 hours. Dr. Dimitris Tsoukalas is such a character. While the majority of the medicinal community is still stuck in the decade when Duran Duran was hitting the Top-40 Singles Chart, Dimitris is changing the landscape of medicine with a fresh perspective. He doesn’t judge other branches of medicine. Instead he sees metabolomics as the missing link between modern and alternative practices, a way to integrate medicine into a functional whole. “Modern medicine is essential to cure acute conditions, and even if it is symptomatic in its approach to chronic conditions, it often provides a window of relief for metabolomics to work efficiently. Alternative medicine with its natural supplements and nutritional regiment, on the other hand, works better when applied with metabolomic insight,” Dimitris explained to me during our next meeting. It took three decades for Dimitris to land in his intersection of medicine. I wanted to find out what got him there, ahead of the pack. It wasn’t a straight route. Dimitris grew up in Athens, Greece, with an Italian mother and a Greek cardiologist father. He studied at University of Naples Federico II in Naples, one of the oldest and most prestigious universities in the world (founded in 1224). He was indecisive about his field at first, interested in deeper questions set by both physics and philosophy. But he was also driven to help people. “As a physicist I would probably have become a high-school teacher. Philosophy … no one knows, a poet maybe,” he grinned. Dimitris graduated as Doctor of Medicine in 1991. And that’s when he came across the first coincidence that set him on the path of metabolomics. The book, written by Dr. Demetrio Sodi Palares (1913–2003), a Mexican cardiologist, the father of modern electrocardiography, was about bringing the body back to its metabolic balance, in order to heal heart disease. “For the first time someone was using data to evaluate feedback, a causative approach. Take for example a headache. Modern medicine prescribes medication that suppresses the symptom. In a causative approach you have to find out why you have a headache. Maybe it’s dehydration, or lack of minerals. Once you find out which, you can address the root cause,” Dimitris simplified. After six years of studying anatomy, muscles, bones, names, and relationships of body parts, Dimitris was ready to move on. He dug into medical libraries to find more causative studies. He was also looking for his field of specialization, which typically requires another 4–7 years of study. The paradox is, the deeper you specialize in traditional medicine, the deeper you dig into a descriptive field. Which is why, to the shock of his highly specialized cardiologist father, Dimitris decided to become a general practitioner. He wanted to learn about all the broad scopes of human ailments: eye, ear, nose, throat, pediatrics, orthopedics, gynecology, microbiology, with a special emphasis on the causative factor. Upon graduating as a general practitioner, he opened up a clinic on the island of Zakynthos, Greece. In the next five years, Dimitris would see over 10,000 patients for a wide range of conditions and founded some of the top health centers in the country. The Ministry of Health invited him to become their chief counsellor. In a relatively short time, he became one of the most respected doctors in Greece. Dr. Tsoukalas’ medical career had reached an early pinnacle, when he decided to jump ship. Dimitris began to treat his clients increasingly with nutrition and supplementation, what he calls a “balanced approach.” Since 2000, he had access to an increasing number of causative studies made in institutions like Yale and Oxford, which he adopted for his practice. The new method began to yield positive results in chronic patients for the first time. That was his signal for change. Dimitris’ colleagues were flabbergasted when he resigned from his executive positions in Greece’s principal health institutions and the health ministry in order to pursue an entrepreneurial career. The jump into the unknown wasn’t a choice, it was the only way forward for him. Dimitris partnered up with a group of entrepreneurs to build the first detox institution in Greece. He used three years to prepare for this venture with deep research on supplementation and nutrition. By combining heat-induced detoxification with nutritional regimens and supplements, the goal was to provide a functional approach to chronic illness. The venture faced an uphill battle. Its success was conditional on educating the market with a disruptive idea. A chronic illness patient who is used to going to a white-walled clinic to meet a white-coated doctor and get a list of medically approved prescriptions, doesn’t easily convert to what may come off as an Apache Indian tradition. The detox program consisted of a 30-day rigorous sweat-and-diet routine. It produced a significant decrease in chronic symptoms, but in order for it to classify as a legitimate therapy, the results had to become objectively measurable. Dimitris discovered an American lab that was able to measure metabolites in 2006. A single test cost $3,000, which put it out of reach for the majority of patients. The cost was attributable to lack of demand. These were highly specialized, molecular tests that doctors with an anatomical approach had no use for. Dr. Tsoukalas saw an opportunity. Dimitris had spent a decade puzzling over the causative science behind chronic illness. He had studied how nutrition, supplementation, and microbiology intersected in chronic illness symptoms. With the onset of metabolomic testing, he was at the right place at the right time, with the right knowhow to lead the field with a fresh vision. Metabolomics had been around as a theoretical field since late 1990s. The first scientific journal on metabolomics was published in 2004. It took Dimitris until 2010 to find a lab that was able to do proper testing cost efficiently. He found the lab by accident, after a medical university submitted a blood analysis of a young boy who was enzyme deficient. A thousand metabolites were pointing to the root cause of his ailment, but also showed another promise. The results were so precise that they could detect extremely small variations attributable to changes in diet and supplementation. This was the objective measurement Dimitris had been looking for. It was also proof of concept for Linus Pauling’s futuristic vision in the 1970s. To be able to heal disease by addressing specific metabolomics imbalances with customized nutrition. Dr. Tsoukalas set up the first metabolomic clinic privately in 2010 in Athens, and began to train other doctors, nutritionists, and molecular biologists in the field. Now that results could be proven scientifically, and the cost of treating a patient could compete with regular health checks, the demand took off. For the past six years he’s been building a diagnostic database that tracks the effects of changes in nutrition and supplementation in his patients, the first one of its kind. With over 15,000 case studies compiled, the diagnostic program is able to analyze and predict the onset of illness with unique statistical accuracy. The results signal a new paradigm shift — this time for the better. Eighty percent of the chronic illness patients that enter Dr.Tsoukalas clinic improve with a significant reduction of symptoms within three to six months of beginning treatment. With metabolomics testing, Dimitris was able to understand why the standard approach didn’t work. In the case of cancer, metabolomics is being used successfully in conjunction with traditional approaches like chemo. The reason Dr. Dimitris doesn’t recommend cutting off chemo abruptly is because of the associated stress factor. Deficiencies and toxic loads can also carry through a mother’s pregnancy and influence the development of the embryo’s central nervous system (See List Below). When Dimitris first began to track the over 5,000 metabolic processes in his patients, he realized a chain of effects that most doctors are unaware of. This meant a regimen of up to 50–60 supplements per day for some patients. Aside from a prohibitive cost factor, the quantity of pills presented a novel problem. Most supplements contain inactive ingredients (like titanium oxide) and other additives that in themselves can represent a toxic overload in big quantities. Then there is quality. A lot of supplements sold in America for example are sourced from China, with low-grade ingredients. The supplementation load typically tapers off after six months, but the metabolomic reality dictates a minimum level of supplementation throughout your lifetime, simply because of the lack of nutrients in our modern food supply. Dimitris’ mission today is to unleash metabolomics in as many parts of the world as possible. The first metabolomic clinic is due to be set up on the West Coast, and very soon it will be possible to send blood tests for metabolomic analysis from anywhere in the world (to get more information on timing and availability, sign up for updates here). As demand outstrips his clinic’s ability to service, his focus is on training more doctors and nutritionists in the field of metabolomics. 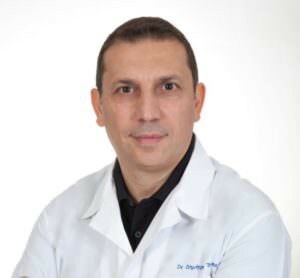 The work on his diagnostic software is almost complete, which means that any properly trained doctor can use a smart database to prescribe customized regimens to clients based on their metabolomics values, without necessarily having to rely on Dimitris’ decades long experience in the field. This, he hopes, will accelerate the propagation of metabolomic clinics around the world. Fifteen years ago Dimitris was studying round the clock with junk food and coffee diet. He developed an autoimmune condition (ulcerative colitis), which he suppressed with pharmaceuticals. He got first-hand experience battling a chronic illness. Had Dimitris not healed himself, he wouldn’t be up to the task of helping others today. At 51, he’s never felt readier and more energized to take on the challenge of shapeshifting attitudes through knowledge. To show that change is possible. Healing is real. And that the message is encoded into the body itself. PS. You can take a free evaluation of your basic metabolomic health indicatorshere. The algorithm is based on the symptomology of over 15,000 metabolomic clients todate. Or enquire about metabolomic evaluations and coaching here.